The Health Communication Core (HCC) developed a campaign for Dana-Farber Cancer Institute's Community Benefits office to increase awareness of and access to Dana-Farber services among residents of Boston neighborhoods at risk of health disparities. The campaign targeted Boston women of color in their 40s and community residents of Roxbury and Mattapan. 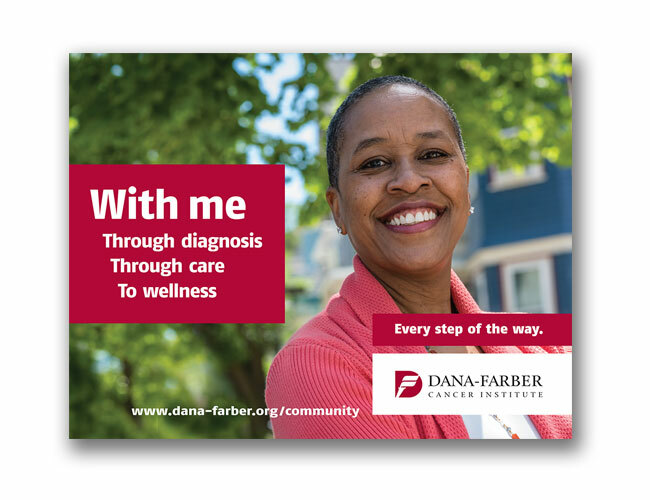 The campaign centered on the theme “Every step of the way,” reminding Boston residents that Dana-Farber offers a continuum of care and services, from prevention to survivorship, and is a local resource that offers world-class cancer care. The campaign aimed to send a message of empowerment and hope, encouraging women to take care of their health and consider Dana-Farber as their neighborhood resource. The campaign could be seen around town on buses and subway cars, in MBTA stations and at bus shelters, and in local newspapers.